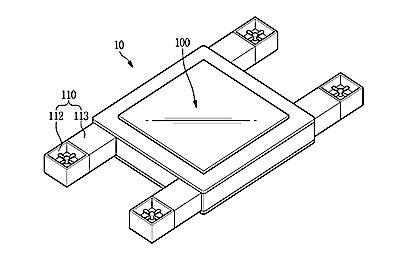 Samsung has been awarded a patent for a device described as a flying display drone that can be controlled by an operator's eyes or voice. DroneDJ reports that the patent, which was first filed in January 2016, was awarded in mid February. According to the patent, the aircraft is "A display device capable of changing an angle thereof based on a gaze of a user while moving along with the user by automatically tracking the user, without an additional operation performed by the user." The drawings show a quadcopter with an LCD display that can be angled to provide the user with an optimum viewing angle in the center. It would also track the user without the user making any input or commands. The patent does not outline any practical applications for the device.